Happy Anniversary to Skewed Studios Fansubs and Scanlations! For those who didn't know, I started out on fansubbing with SkewedS as GekiViolet. Why GekiViolet? I was known by that name before I changed it to GekiDan due to a reason that GekiViolet is kinda a popular name and many guys are already using that. And now back on the SkewedS story... I was recruited by zeldAIS via Henshin Justice Forums. He asked me if I could be a Splash Designer and make one for Bakuryuu Sentai AbaRanger. I accepted it and started making images. Here is my first design that was used. 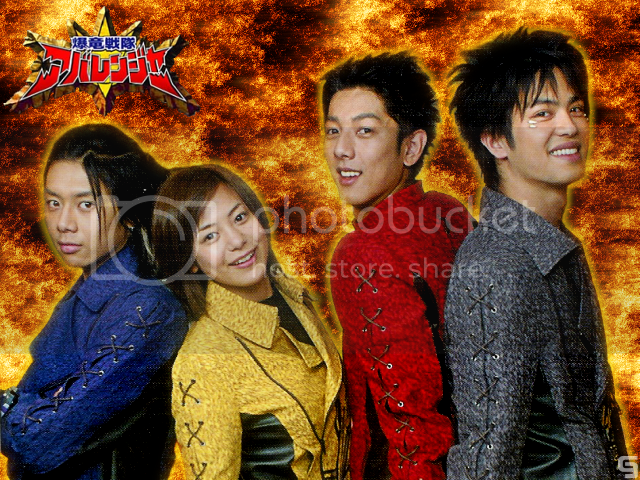 From then on, I regularly make splash images for SkewedS (with some for Henshin OrganizatioN). But aside from splash designing, they also taught me Timing, and Typesetting. I will take this opportunity to thank the SkewedS guys, especially zeldAIS, for bringing me to where I am now, and knowing how hard really it is to become a fansubber. I'm happy to become part of this group and will always be a part of it. And as a Japanese entertainment fan, I thank the guys for bringing us quality work and great subs. Good luck on your future projects. Again, Happy Anniversary and may SkewedS live forever!